I am Pennywise, and my little sister is Georgie. 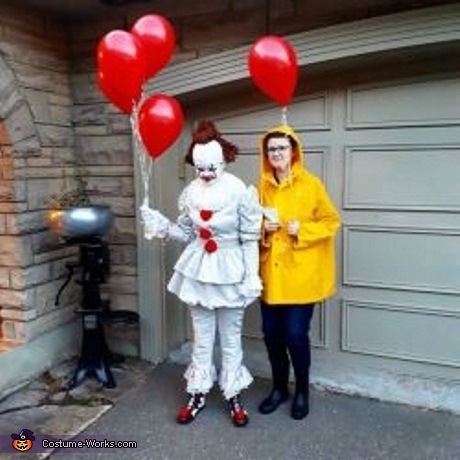 Me and my sister saw IT a few times in theaters, and we decided the week the movie was released that we wanted to be Pennywise and Georgie for Halloween! -The Pennywise wig was homemade! It was a paper mache hat that was spray painted white. We bought an orange/red wig and cut it up. Then we hot-glued the pieces of the wig to the paper mache hat. We then styled the wig with liquid elmer's glue (watered down) left over from the paper mache, and used it as a "gel" to hold the wig's style in place. -Pennywise's shoes and outfit were custom made by a tailor I found online. I do not know all of the materials used at the top of my head. Both costumes cost a total of $285! !